Biggles is a super dog for anyone who likes the hounds. 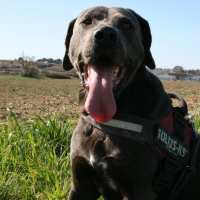 He is a bleu de Gascogne who arrived as an unidentified stray courtesy of a local mairie, and as he is so young (born in March 2017) he can now have a normal life rather than spend it in a hunt kennel, which was probably his destiny. He would have hated that; Biggles is not the bravest dog in the world and will jump out of his skin at the sound of a car backfiring. Biggles is fine with cats and there are some videos of him off the lead in the cat house on the DRC Youtube channel. Not only that, he is wonderful on the lead, trotting along like a champion on a slack lead. Biggles is fine with other dogs and people of all ages. Hurry hurry hurry if you like this boy. 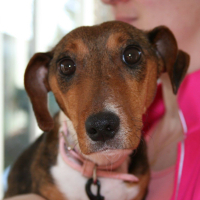 Apolline is as much whippet as she is beagle, she is fine boned and made for speed. However she too is one of the beagle bunch. Like Hermes Apolline was briefly adopted, however as the family did not have an enclosed garden, she was brought back. It was a mistake on the ScPA’s part to let her leave, as it seems pretty obvious that an 18 month old beagle cross will go exploring. However it must be emphasised that Apolline didn’t go far, just to the neighbour’s garden. So no Fort Knox style fencing required, just a “normal” fence should be enough. 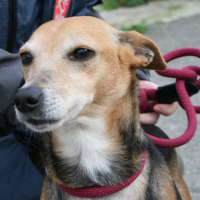 Apolline is a lovely girl, affectionate though a bit timid at first. Simply adorable. It is wonderful to be able to put Levy and Sammy on this site. They are two of seven dogs who were brought to the refuge one by one over the period of a month or so last summer. They had all been left in a garden when their owner basically just ran away from the mess he was responsible for. The dogs’ mother, Mattie was brought in with the “pups”, all of whom were one year old at the time and had never had any contact with humans. 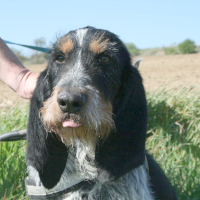 Mattie was well socialised and was adopted very quickly. The pups have been a lot harder work. Levy went for a walk last week and proved to have made huge progress. He walks well, although like all these dogs likes to hear a friendly voice as he walks. He is very affectionate and just needs a bit of guidance, but his desire to please means that he is very responsive. Yes, he and Levy are two hidden gems! Sammy was born in August 2017 and is a weimaraner cross. It is wonderful to be able to put Levy and Sammy on this site. They are two of seven dogs who were brought to the refuge one by one over the period of a month or so last summer. They had all been left in a garden when their owner basically just ran away from the mess he was responsible for. The dogs’ mother, Mattie was brought in with the “pups”, all of whom were one year old at the time and had never had any contact with humans. 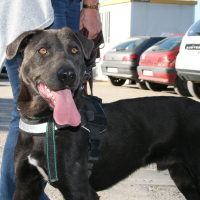 Mattie was well socialised and was adopted very quickly. The pups have been a lot harder work. Sammy went for a walk last week and proved to have made huge progress. He walks well, although like all these dogs likes to hear a friendly voice as he walks. He is very affectionate and just needs a bit of guidance, but his desire to please means that he is very responsive. Yes, he and Levy are two hidden gems! Sammy was born in August 2017 and is a weimaraner cross. Dyson (what a great name for a dog!) is a Cursinu cross, which is a Corsican breed dating back to the 16th century and originally used to herd sheep. And he is a fabulous lad, too. Tall and with fabulous pale brindle markings. 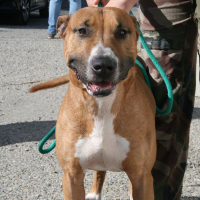 Dyson is at the refuge because his owner has unexpectedly become homeless and wants his dog to have a better life. And Dyson should have no problems finding a home, bearing in mind that he is good with other dogs, cats and children! 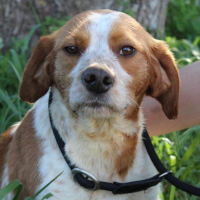 He was born in November 2014 and is vaccinated, identified and castrated. All he needs is a new home and he will be all set! Oh, what a shame. Stewey had a home and everything seemed to be going so well. The ScPA received photos and videos of him enjoying his new life, and his owners said they loved him. Only they didn’t really, as it turned out. Stewey was not clean in the house overnight. Now there are many ways of dealing with this, but first up is to see a vet and make sure there is no medical reason for it. This is what the family was advised to do, but rather than do so they waited a week to see if things resolved themselves then brought poor Stewey back. I suspect that with a bit of patience and perhaps a bit of crate time, all would have been well. Stewey was adopted in mid February, it was still early days. But some people want instant perfection. Perhaps the company and guidance of another dog in the family will do the job. 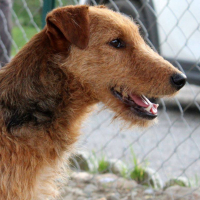 Stewey is a lovely fox terrier who was born in December 2013. He is fine with other dogs but not cats. Bezingha was brought to the ScPA by one of their cruelty inspectors; she has not been mistreated at all, but she was definitely not wanted and a life of neglect awaited her. Her owner was a hunter, and Bezingha does not like to hunt. Clever girl. Instead of spending her life in an outside kennel with 5 other dogs, she is at the ScPA with a far far better life to come. Bezingha is a bruno de Jura cross who was born in January 2018. 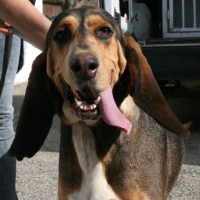 She is fine with people, (not at all timid) and loves other dogs. So far her interaction with felines has been limited to being biffed on the nose by the office cat, but she might well chase ones that run. A fabulous fabulous dog for everyone that likes dog with long ears! Pryce is a big chunky lad with quite a bit of bull terrier in him. Unlike staffie crosses, this breed is not categorised in France, meaning that they do not require any special permits. This of course if good news for dogs like Pryce; he can be adopted just like any other dog. He was brought in as his owner has been hospitalised. Pryce has been well loved and well looked after all his life. He was born in November 2013 and has good basic obedience. He pulls quite a bit on the lead, but that is something we will work on at the refuge. 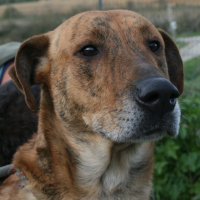 Pryce is a really lovely boy and we would love to find him a home. Looking for a young small, and very active dog? Meet Hermione, a tiny jack russell cross who was born just over a year ago. When she arrived at the refuge she was very thin, but that didn’t seem to reduce her energy levels, and now she is back to full strength, she is a real firecracker. Having said that, she does love affection, and if you gather her in your arms, she does a great impression of a lap dog. Quite a wonderful mix! Hermione is very small, not much more than ankle high. She is a great little girl, if you like ‘em small and feisty!